Crops of focus: raspberry, blueberry, strawberry. DeVetter, L.W., S. Watkinson, I.A. Zasada, J.E. Weiland, and T.W. Walters. 2018. Effectiveness of non-tarped broadcast fumigation and root removal on root lesion nematode and Fusarium and Pythium species in a red raspberry system. Plant Health Prog. doi:10.1094/PHP-01-18-0006-RS. Rudolph, R., T. Walters, L.W. DeVetter, and I.A. Zasada. 2018. Contribution of a winter wheat cover crop to the maintenance of Pratylenchus penetrans populations in the raspberry production system with management considerations. HortTechnology. 28(2):182-188. Rudolph, R.E., I.A. Zasada, C. Hesse, and L.W. DeVetter. 2018. Brassicaceous seed meal, root removal, and chemical fumigation vary in their effects on soil quality parameters and Pratylenchus penetrans in a replanted floricane raspberry production system. Soil Ecol. https://doi.org/10.1016/j.apsoil.2018.08.024. Arrington, M. and L.W. DeVetter. 2018. Increasing honey bee hive densities promotes pollination and yield components of highbush blueberry in western Washington. HortScience 53:191-194. Gallardo, K., E. Stafne, L.W. DeVetter, Q. Zhang, C. Li, F. Takeda, J. Williamson, W. Yang, R. Beaudry, B. Cline, R. Allen. 2018. 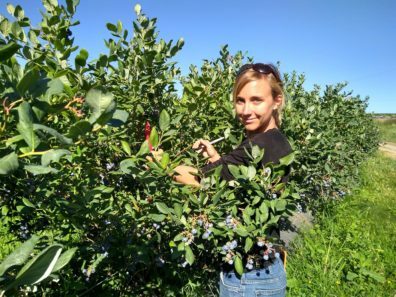 Blueberry producers’ attitudes toward harvest mechanization for fresh market. HortTechnology 28:10-16. Arrington, M. and L.W. DeVetter*. 2018. Floral morphology differs among new northern highbush blueberry cultivars. J. Hortic. 5:1. DeVetter, L.W., H. Zhang, S. Ghimire, S. Watkinson, and C.A. Miles. 2017. Plastic biodegradable mulches reduce weeds and promote crop growth in day-neutral strawberry in western Washington. HortScience 52:1700-1706. Cover article. Miles, C., L.W. DeVetter, S. Ghimire, and D.G. Hayes. 2017. Suitability of biodegradable plastic mulches for organic and sustainable agricultural production systems. HortScience 52:10-15. Ghimire, S. (former graduate student in Miles’ program), D. Hayes, J. Cowan, D. Inglis, L.W. DeVetter, and C. Miles. 2018. Biodegradable plastic mulch and suitability for sustainable and organic agriculture. WSU Extension. FS103E. Zhang, H. (graduate student), C. Miles, S. Ghimire, C. Benedict, I. Zasada, and C. Benedict. 2017. Application of biodegradable plastic mulches on tissue culture red raspberry. WSU Whatcom Ag. Monthly. Pp. 5. Accessible at: http://extension.wsu.edu/wam/application-of-biodegradable-plastic-mulches-on-tissue-culture-red-raspberry/. Zasada, I., L.W. DeVetter, T. Walters, and J. Weiland. Research update for commercial raspberry growers: Soilborne disease & nematode management in a changing fumigation landscape. The Northwest Berry Foundation’s Small Fruit Update Special Edition. Pp. 15. Accessible at: http://www.nwberryfoundation.org/SFU/2017/September%20Special%20Edition%20SFU.pdf.